Also drops off a Massive Bazu in Nobles Causeway. Looted one from Silentpaw in Dranik's Hollows (Murkglider's Hive). Drops off Granitesmash in Ruined city of Dranik. 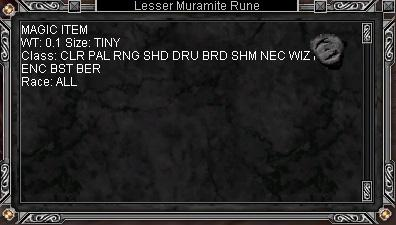 I can confirm that Pixt Arreand Bodybender in Noble's Causeway drops the Lesser and Minor Muramite Runes. Confirmed, drops in Wall of Slaughter off mobs that con yellow to 66.